A leading expert in the dynamics of glaciers and ice sheets, Dr. Robert Bindschadler from NASA's Hydrospheric and Biospheric Sciences Laboratory and Goddard Space Flight Center discusses the threats posed by the Pine Island Glacier in West Antarctica, the applications of satellite data, and the success of the International Polar Year (IPY) 2007-08. Where is the Pine Island Glacier located? The Pine Island Glacier is in West Antarctica, the part of Antarctica that lies in the Western Hemisphere and which contains about 10% of the Antarctic Ice Sheet. This glacier drains much of the West Antarctic Ice Sheet (WAIS) flowing north into a part of the Southern Ocean called the Amundsen Sea. You can view its location quite clearly in this NASA video. How long have you been studying it? Glaciologists have only been studying West Antarctica intensively for 25 to 30 years. 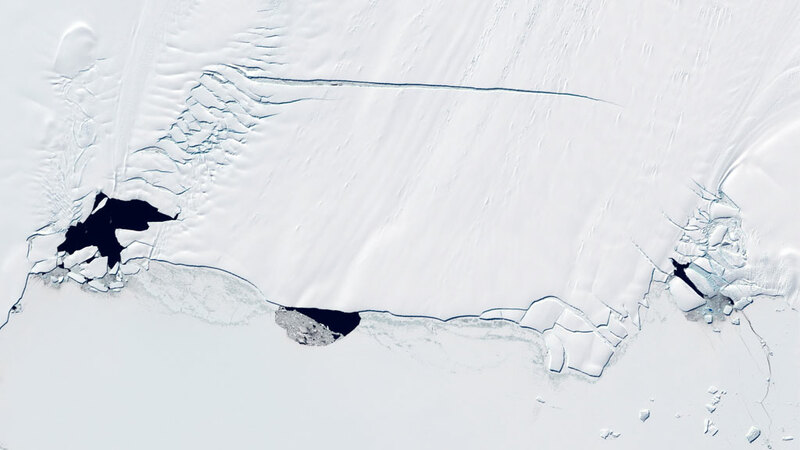 Because the Pine Island Glacier is so remote, the first information we received that told us it was changing rapidly came from satellite measurements collected in the 1990s. In your view, why does this glacier demand particular scrutiny? Because the changes we’re seeing are dramatically large. Ice flow is accelerating and the glacier is retreating and thinning very rapidly. The vast West Antarctic Ice Sheet sits on a bed well below sea level, which makes it inherently unstable. Once it starts to retreat, we expect it will continue to retreat because the edge of the ice sheet will retreat into deeper and deeper water, causing it to retreat even faster. If you were to ask what the collapse of a marine-based ice sheet would look like, our answer would be accelerating flow, thinning ice, and retreating margins. And this is exactly what we’re seeing in Pine Island Glacier. When you put the two together, you think, “My goodness! Could this be the initial chapter of the collapse of the West Antarctic Ice Sheet?” It’s where all the red flags are being raised in Antarctica. How soon could this collapse take place? Or is it too early to tell? If we’re witnessing the opening chapter of collapse, we’re not sure how rapidly the collapse will take place, or if particular phases of it will happen rapidly and other phases slowly. Just how large is the catchment area of the Pine Island Glacier inland? The West Antarctic Ice Sheet is divided into three big regions: One flows into the Ross Ice Shelf and represents about one third of its mass, another third flows into the Ronne Ice Shelf, and then a third flows primarily through Pine Island Glacier and its neighbour the Thwaites Glacier into the Amundsen Sea. So the catchments area of the Pine Island Glacier represents about a third of the West Antarctic Ice Sheet, and holds enough ice to raise global sea levels by 1.5 metres if the ice from the entire catchments area were to flow into the ocean. What about the other two thirds you mentioned? The other two thirds have more of their volume resting on rock above sea level, so some of that ice could remain intact whilst the marine based part would flow out into the ocean. Do we have figures for what that would represent in sea level rise? The latest study, which looked at the most vulnerable and unstable regions across the West Antarctic Ice Sheet, came up with about 3.5 metres of sea level rise. The Korean Polar Research Institute is planning to build a new research station close to Pine Island Glacier on the coast of West Antarctica. Will this be helpful for your research? It would be extraordinarily useful and advantageous to have a base there. From what I understand, the Koreans are looking for a site right in the heart of that area, which is changing very rapidly - a site where they can land an airplane and where they can bring in a ship. At the moment, logistical support is extremely complicated, because we need a very specialized type of base camp that can support helicopters to work on the ice shelf. It’s almost a full station and we’ll have to wait two or more years just to get the support we need before we can conduct research on Pine Island Glacier. When is your next research expedition to Pine Island? It won’t be until 2011-2012 that we can set our boots back on the surface of the ice shelf. Aside from the Pine Island Glacier, what other ongoing or future projects do you have in Antarctica? Right now, I am also working on data sets obtained by the ICESat and Landsat satellites to try to quantify how much ice is flowing from the grounded ice sheet back into the ocean. It’s something we’ve been working to quantify for a long time, and although we do know parts of the numbers corresponding to the really big outlet glaciers, there are a lot of slower flowing boundary glaciers for which we don’t have any measurements. So we’re working with these satellite data sets to try and come up with a first estimate. I have also just led the IPY Landsat Image Mosaic of Antarctica (LIMA) project. This is the first true colour high-resolution image mosaic of Antarctica. It was funded by four agencies (NASA, the US Geological Survey (USGS), the US National Science Foundation, and the British Antarctic Survey (BAS). One of our goals with that was to provide a scientific data set for scientists, but equally important, to produce a valid true colour picture of Antarctica so people could see what it really does look like and get more familiar with the continent. With this project, we’re trying to bring Antarctica to people because most people aren’t going to be able to go there. For example, we have been able to produce lots of animations of what Antarctica looks like to help explain and illustrate the science we’re doing in Antarctica. And what have been the scientific applications of LIMA? One of the neatest uses - one I never anticipated - was where some BAS biologists used it to map penguin rookeries all the way round the continent. Because the LIMA mosaic is true colour, they could see penguin residue (droppings) and identify the spectral signature of an active versus an inactive colony. They also discovered rookeries that were not known before. What is your assessment of the International Polar Year and what it has brought to the field of glaciology? Glaciology had a big component, but actually in relative terms, it was small compared with other components. What amazed me most about the IPY was its breadth and the eagerness with which the scientific community embraced the concept and supported it. It surprised me with the types of science and even the combinations of science that came out. It was not what I had envisioned, but it was almost a magnitude better than even my boldest vision of what it could be. It really grew to something far beyond what I thought it could’ve been. And it also surprised me in its goal of reaching out to people in a variety of ways: telling people why we’re doing polar research, what it’s like to do polar research, and why the research that we’re doing and what we’re finding out matters to people throughout the world. The education and outreach part of it has been an extraordinary success. What where the principle disciplines that glaciologists collaborated with during the IPY? I would say primarily geologists and the modelling community. We already had our own modelling sub-community, but the issues of the ice sheet, how it’s changing, and how it’s affecting sea level have attracted people with modelling skills from outside the field of glaciology: mathematicians and people already working with large computer models. We’ve had many modellers showing up at our meetings wanting to learn more about our specific problems, and then coming up with unique ways of approaching them. We’re certainly better off for having attracted that type of expert to our field. Yes, certainly. I would say the union of glaciology and oceanography is really at the cutting edge right now. We can’t understand the flow of the ice sheets or interpret our measurements without fully appreciating how the ocean is interacting with the ice. It really is the ocean that is driving a lot of what the ice sheet does. That’s why you’ll find that field programmes now include both oceanographers and glaciologists. We need to understand both fields in a very coupled and interconnected way. Robert Bindschadler is a leading expert in the dynamics of glaciers and ice sheets. He is Chief Scientist of NASA's Hydrospheric and Biospheric Sciences Laboratory, a Senior Fellow at the Goddard Space Flight Center, a Fellow at the American Geophysical Union, and a past President of the International Glaciological Society. He has lead fourteen field expeditions to the Antarctic.